The following post is an excerpt from my recently released “Kona 2011 Rating Report”. Please visit the download page when you’re interested in some more statistics around the upcoming world championship race. The Rating Report is also ideal if you’re going to watch the Kona race and want to know some more background on the racing pros. Based on previous results, Andreas Raelert and Marino Vanhoenacker are the clear favorites for Kona. They’ve had great results in last year’s Kona and produced the two fastest results of all time over the Ironman distance. One could argue that Crowie should also be included in the favorites and it’s tricky to bet against a two-time-winner and with a great pre-Kona result in winning the 70.3 world championships. However, his latest results over the IM distance were not really top-notch (“only” a fourth place in Kona 2010 and – compared to this summer’s blazingly fast times by Andreas and Marino – a relatively slow win in Cour d’Alene). He is also hurt by his lack of really fast times, he just seems to produce adjusted times between 8.15 and 8.20. On the women’s side, there is only one favorite: Chrissie Wellington. The only bad “result” she has had was her DNS in Kona last year. She has won all her IM races, and set another fantastic world-record time in Roth earlier this year. Even defending champion Mirinda Carfrae doesn’t have the IM results to get statistically close to Chrissie. The probability of Chrissie winning the race is less determined by her competition, but more by her chance of not starting or finishing. It seems that the most interesting speculation in the women’s race is how far up on the men’s side Chrissie is going to finish. The chance I see for a TOP10 finish for her: less than 2%. Even if Crowie doesn’t look too good for a win (statistically speaking), he is a solid racer and a safe bet for a TOP 3 finish. Tim O’Donnell is only racing his second IM, on a good day he may contend for a podium spot together with a number of very experienced Kona racers. Mary Beth Ellis joins Chrissie and Rinnie as my podium picks. It remains to be seen whether she has properly recovered from her qualifying races. If she falters, there is an interesting mix of experienced and newer IM racers to grab one of the top spots. Newer results are more heavily favored over older ones than in the ratings (aging factor of 0.55 instead of 0.8 per year). Kona results are favored over other courses’ by a factor of 3. The more results an athlete has, the smaller the chance of a DNF or “off race”. Winning a race gives you an extra bonus (the adjusted time is reduced by 1%). Of course, all this analysis can only take previous results into account. Factors such as recent results in shorter races (for example the 70.3 world championship), injuries or the impact of a focused Kona prep vs. lots of races are hard to gauge and aren’t part of my prediction model. 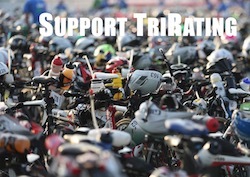 Kona 2011 Rating Report is ready for download!